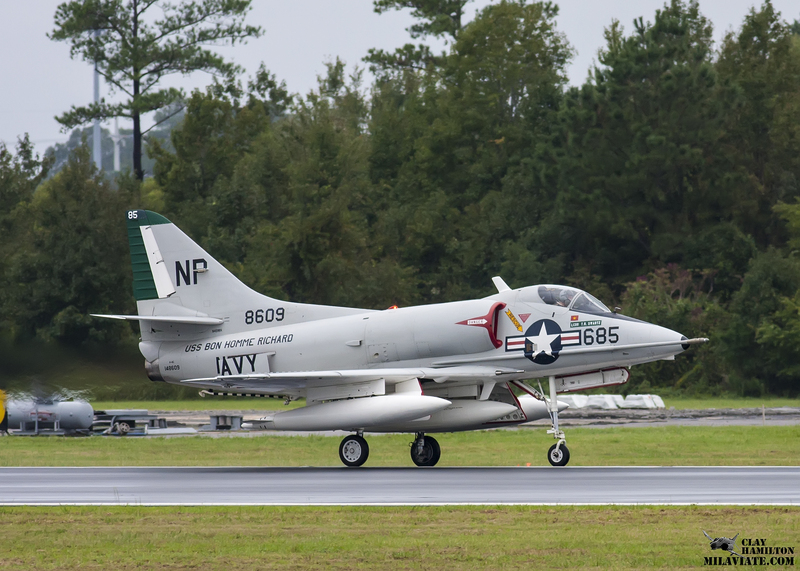 On this day in 1954, the A-4 Skyhawk had its first flight. The A-4 was a light-attack aircraft designed by Douglas Aircraft Company (and later McDonnel Douglas). It had a top speed of more than 600 miles per hour and the aircraft’s five hardpoints enabled it to carry a variety of missiles and bombs and it was even capable of delivering nuclear weapons. It was said that A-4 pilots would say “you don’t climb into an A-4; you strap it on” due to its small size. In fact, it was so small that it didn’t require folding wings to conserve space as other Navy jets did. Its impressive maneuverability enabled it to fly like a fighter but still deliver bombs with great accuracy. This maneuverability resulted in the US Navy choosing it to replace the F-4 Phantom as the demonstration aircraft for The Blue Angels. Affectionately known as the “Scooter” and also “Heinemann’s Hotrod” after its designer Ed Heinemann, the A-4 serve with the United States Navy until 2003 and the United States Marine Corp until 1996, with 2,960 aircraft build during its production run.